Any new mother will tell you that it feels wonderful to get a few reminders that she's still stunning. We have put together a bouquet that will help you remind her that you have eyes only for her and the new addition in your lives. 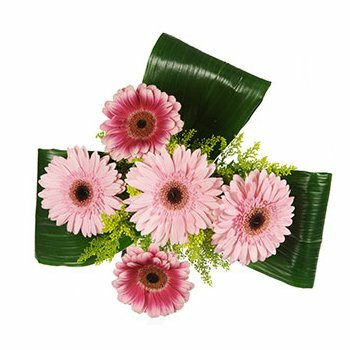 Your recipient will receive an arrangement of 3 dark pink Gerberas contrasted with 3 pale pink Gerberas and accented with lovely greenery. Welcome home your newly born, Congratulate newlyweds, or add some grace to a baby shower with A Touch of Pink.